So, I spend half my time on here moaning about how I find it hard to maintain my travel blog when I can’t travel all the time. Therefore this summer I have a few posts lined up on spots in the UK that are worthy of a little staycation! Not too different to the usual travel posts on here, but without having to leave the UK and endure the current flight delay palava. To start this off I’m going to begin with Norwich -‘The Fine City‘. This gorgeous city is where I spent 3 years at university, and I still have a soft spot for the place and will recommend it to anyone who’ll listen. In my experience it’s always been a laid back, friendly little city which is full of gorgeous spots for somewhere to eat or just a drink. There’s plenty of things to do, and if you have longer than a weekend I’d definitely recommend heading to the Norfolk Broads as it’s perfect for a sunny day with a pub lunch sandwiched somewhere in between. A few weekends ago I headed back to Norwich to visit two of my best uni pals and also visit the Gin Festival. It was a first for me, but for £16 you can get a ticket, glass, gin recipe book and 4 hours in the festival surrounded by gin – absolute bargain. 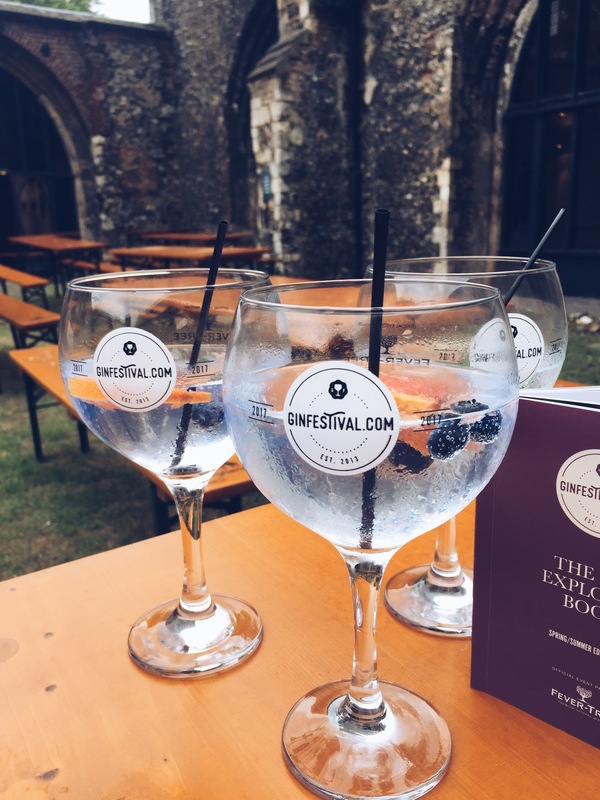 I’d definitely recommend the festival if you’re a gin lover – and the great news is it’s not even a Norwich exclusive event, as it tours around the country – other dates on the tour can be found here. Anyway – Back to Norwich..! If you’re visiting the fine city then I’ve listed my favourite places to visit and eat/drink whilst your there – check them out and let me know what you think in the comments below! Every fancied having bolognaise… but on a waffle? Well you’re in luck! The Waffle House serves meals – both sweet and savoury – all on top of a waffle of your choice, large, small, white or wholemeal. They’re made fresh right at the restaurant and you can really taste it – a big, sugar-fueled American-style chain this is not. The last time I went to visit I had a breakfast of scrambled egg, bacon, sausage, mushroom and beans – and then ate my waffle after like a little breakfast desert – complete with maple syrup. Basically a two course breakfast, which is frankly, the absolute dream. I’d definitely recommend this place to anyone coming to visit Norwich – it’s not what you expect when you think of a waffle restaurant – there’s no nutella to be seen, but I think it’s a great place, and if you’re really not into the waffle part they serve normal (non-waffle-y) meals as well. The Lanes in Norwich are a cluster of little alleys lined with independent shops and cafes. They’re a great way to get lost and find little treasures in vintage shops you’ve never heard of. The pubs in the lanes are also a nice place to stop for a drink. Start off at the top of the lanes and follow them round, allowing yourself to get lost – who knows what you’ll find. This is a little Italian restaurant I found by accident – and I’m so glad I did. My favourite recipe always has to be the Linguine al Salmone, which I’ve tried to recreate so many times at home and never managed to get it quite as right. The prices are really great for the huge amount of food you get on a plate, and it’s a lovely local business that is well worth supporting. I’ve never seen such a large selection of cake on offer before, and for that alone it’s worth a visit. But if you’re on the hunt for something more filling than a slice of cake and cup of tea, the brunch menu at Cafe No.33 is brilliant. It’s around the lanes area if you fancy a break for browsing, and if you haven’t got enough room at the time, the cake is perfect to take away for a later snack. I am a bit biased towards Cinema City, because as a Film student at the university we would visit here quite a lot. It’s a beautiful little cinema (ran by Picturehouse) with a great bar and restaurant for afterwards – fairy-light laden courtyard and all. It’s perfect for making an evening out of going to the Cinema, and the chair-holder-wine-glasses are a great addition. I was lucky enough to have a membership here gifted to me when I was at uni, so would visit here quite a lot – and I still go back to it now when I can. Pedro’s is a restaurant you would definitely not expect from the outside. Sitting in the middle of Chaplefield Gardens, I expected it to be a little village hall until someone took me there to experience Pedro’s – a Mexican restaurant that definitely doesn’t do things by halves. The food is huge, so tuck in to a chimichanga, drink a frozen margarita whilst you’re wearing a sombrero. Nestled in the lanes this is a perfect place to stop for a pint, or whatever tipple takes your fancy. They also do a Friday fizz and chips deal with the Grosvenor Fish Bar opposite, which is a great budget lunch if you need one. They also have great evening events at the Birdcage, so check it out if you’re in Norwich for a few nights and fancy a party. To my shame I never came to visit here when I was a uni student, but have only discovered it in my recent re-visits. The Bicycle Shop is a cute little cafe with a wide ranging menu, so its perfect if you just want an iced coffee (best I’ve ever had – seriously!) or a fill-you-up brunch. Another cafe, I know, but Frank’s is a beautiful little cafe nestled away in the lanes, a stones throw away from Cinema City. It’s perfect for all occasions – from brunch to evening drinks – they also have live music nights and films on a Sunday. Norwich is quite well known for it’s market, with it’s rows of little market huts. Just like the lanes you can take a step in here and get lost for a while, as it’s certainly bigger on the inside than in looks. And there we have it – my top recommendations for what to do/go and see/eat and drink when in Norwich. If you’re visiting the Fine City, check out Airbnb as there are some great and affordable options, all within walking distance of the city centre. If you have even longer to spare, definitely check out the Norfolk Broads, as a boat hire and a few bottles of prosecco makes a brilliant afternoon exploring. If I’ve missed anything out please let me know in the comments below! Hope you enjoyed reading, and look out for any more Norwich snaps appearing on Instagram!